United Technologies Corporation (UTX) provides technology products and services to the building systems and aerospace industries worldwide. This dividend achiever has paid dividends since 1936 and increased distributions on its common stock for 17 years in a row. The company’s last dividend increase was in June 2012 when the Board of Directors approved an 11.50% increase to 53.50 cents/share. The company’s largest competitors include Honeywell (HON), General Electric (GE) and Boeing (BA). 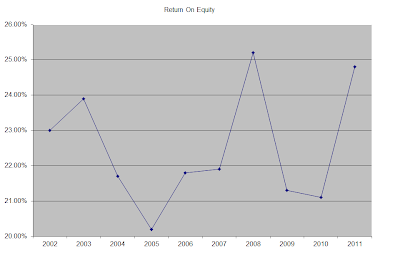 The company has managed to deliver 10.60% in annual EPS growth since 2002. Analysts expect United Technologies to earn $5.52 per share in 2012 and $6.68 per share in 2013. In comparison United Technologies earned $5.49/share in 2011. In 2011, United Technologies agreed to acquire Goodrich Corporation (GR) for $18.40 billion. United Technologies expects to finance the transaction through a combination of debt and equity issuance. The equity component is expected to approximate 25 percent of the total. The closing is subject to customary closing conditions, including regulatory and Goodrich shareholder approvals. Although this deal is expected to be dilutive in the first year at up to 50 cents/share, it should strengthen United Technologies position in in creating high-value systems for commercial aircraft manufacturers. Long term growth will be benefited from acquisitions as well as organic growth projects. Potential slowdown in key markets such as China however, could deliver some short-term weakness in revenues.The backlog in commercial airplanes at Boeing and Airbus until 2013 is one positive fact for United Technologies. Another plus will be orders to Otis for the new World Trade Center. The introduction of the Boeing 787 would also be positive for revenue growth. United Technologies generates 60% of its revenues from outside the US. Growth in emerging markets such as China would certainly add to the bottom line. United Technologies has managed to maintain a consistently high returns on equity in the 20% - 25% range over the past decade. Rather than focus on absolute values for this indicator, I generally want to see at least a stable return on equity over time. The annual dividend payment has increased by 15.30% per year over the past decade, which is higher than to the growth in EPS. This has led to an expansion in the dividend payout ratio for the company. United Technologies tends to boost dividends after five quarters, and not after our quarters like other companies. A 15% growth in distributions translates into the dividend payment doubling almost every four and a half years. If we look at historical data, going as far back as 1974 we see that United Technologies has managed to double its dividend every seven and a half years on average. The dividend payout ratio has increased over the past decade, rising from a low of 22% in 2002 to 34% in 2011. 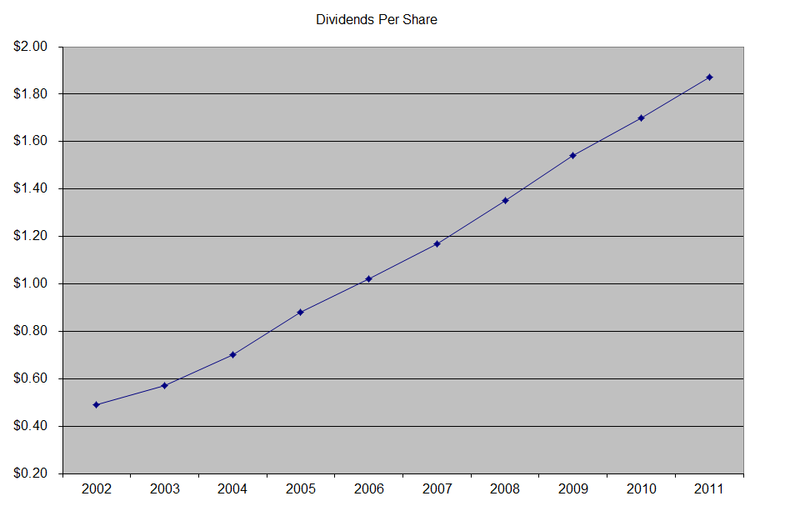 This explains the fact that dividend growth has been faster than earnings growth over the past decade. A lower payout is always a plus, since it leaves room for consistent dividend growth minimizing the impact of short-term fluctuations in earnings. Currently, United Technologies is attractively valued at 15.40 times earnings, yields 3% and has an adequately covered dividend. I would consider adding to my position in the stock subject to availability of funds.